Gutter and downspout is an important part of a building. You can not truly enjoy your property unless your gutter system works properly. At NICK’S Window Cleaning, we provide all sorts of gutter repair and restoration services. We are an established company having more than ten years of experience in this field. We have a team of highly skilled and experienced workers. No matter what sort of gutter problem you are facing, our workers will resolve it efficiently and quickly. Our framework is secured by full liability insurance and our workers have WSIB coverage. Gutter failure occurs due to many reasons. One of the main reason is faulty installation which causes a lot of trouble down the road. Each reason causes a different type of anomaly or failure in the system. However, each failure ultimately leads to seam or joint failure. Seam failure occurs due to deterioration of sealant compound of seals. Seams can be easily repaired by mending respective gutter segments. Seam repair stops all kind of leakages and is considered one of the most efficient method in gutter repair. Our experts are skilled and experienced in seam restoration and treating other related problems. 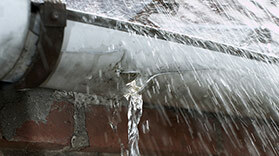 Gutter systems need regular maintenance otherwise they do not work efficiently at their full capacity. Regular maintenance also increases the overall life of your gutters. Many people try to save their money by ignoring small problems in their gutters. But these problems, eventually turn into more troublesome and costlier problems. If you want your gutters to work efficiently then you should get them inspected at least twice a year. Our experts are highly accomplished in tackling small maintenance problems. Sagging of gutters is a commonly ignored problem. If left untreated, sagging can lead to many severe problems like seam failures. That is why it should be dealt with in its early stages. Residential and Commercial gutters are usually larger than ordinary gutters that is why they face many intense problems. Fallen leaves in autumn and debris accumulation with time lead to clogging of gutters. Water accumulation in these clogged gutters result in sagging and loosening of joints. That is why gutters of large facilities require more rigorous cleaning and more frequent inspection than ordinary gutters. We have been providing our gutter repairing services to various large facilities for more than ten years. We are highly experienced in dealing with all sorts of gutter problems of residential and commercial centres that is why we are the top choice for gutter repair services in Richmond Hill. Safety: Our experts work in a safe manner and do not cause any damage to your property. Customer service: Our customer service is top-notch. We value our customers and treat them and their properties with respect. Free-of-cost estimate: We provide a free-of-cost estimate of the work to be done, so that you can take better decisions in your selection of our services. Gutter and downspout are the most overlooked part of a building. Many of us do not pay attention on their cleaning and proper maintenance unless some severe problem might appear. You do not need to do this kind of troublesome stuff by yourself. Hire some professionals who will make sure that your gutters are working properly. This is one of the wisest move that you can make as a property owner. Regular maintenance of your gutter systems can save you a great deal of trouble and money, too. Small problems, if left untreated can turn into huge and costlier problems. That is why you should never ever ignore even the slightest problem in your gutter systems. 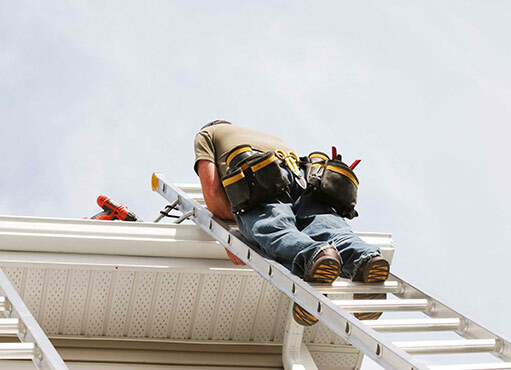 Hiring a professional for your gutter repair work is a smart decision. You can not do everything on your own. Gutter repair is an extremely dangerous task and requires especial tools and knowledge. You can never hope for good unless you have both. Still you will lack that experience which professionals do have. Many good people have been seriously injured trying to save some bucks or end up creating more costlier problems. Why go for all this trouble? Just hire someone for this risky work and relax. At NICK’S Window Cleaning, we provide all kinds of gutter repair and cleaning services. We have a team of highly skilled and experienced technicians. We provide all gutter-related services like soffit repairs, corner leakages, leaking gutters, sagging gutters, overflowing gutters, blocked downspouts, leaking downspouts, patching eavestrough holes and much more. We do everything! We have been serving Richmond Hill for more than a decade. We have all the resources needed for all kinds of gutter restoration. We have the right tools, the latest ladders and associated equipment to carry out the work without damaging your property. We offer the best quality work in the most affordable rates. Our services are the best!